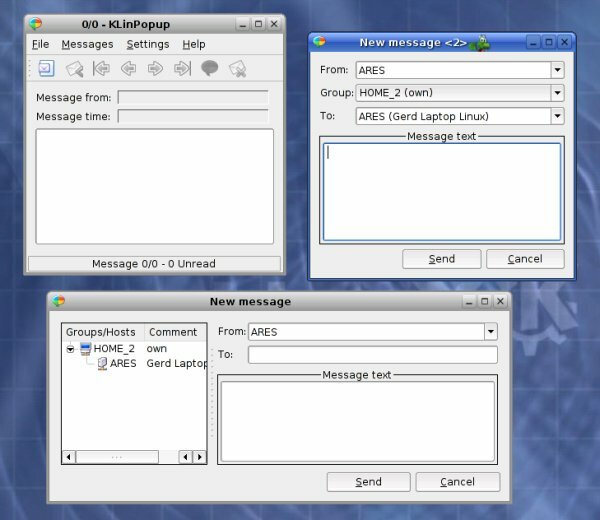 KLinPopup is a program like Linpopup, Linpopup2 (Gtk2+) or KPopup (heavily based on this) to receive and send Windows popup messages (Winpopup or "net send") with Unix/Linux. It uses Samba to do this. You should be able to receive/send messages from/to OSs where Samba is running on (e.g. BSDs, Linux, OSX) and of course Windows 2000/XP. For Windows 95/ME you need an additional Winpopup program. Also Kopete can handle winpopup messages (works in 0.12 again). Kopete 0.12beta2 is out, packages for various distributions are here. KLinPopup is released under the GNU GPL2. Feel free to send feature requests or anything else (translations) to gerdfleischer@web.de. Maybe soon it will be in the portage tree. Using inotify if available for message arrival detection. Replaced showToolBar + friends with recommended members.